We are enjoying summer here at Northern Homestead. 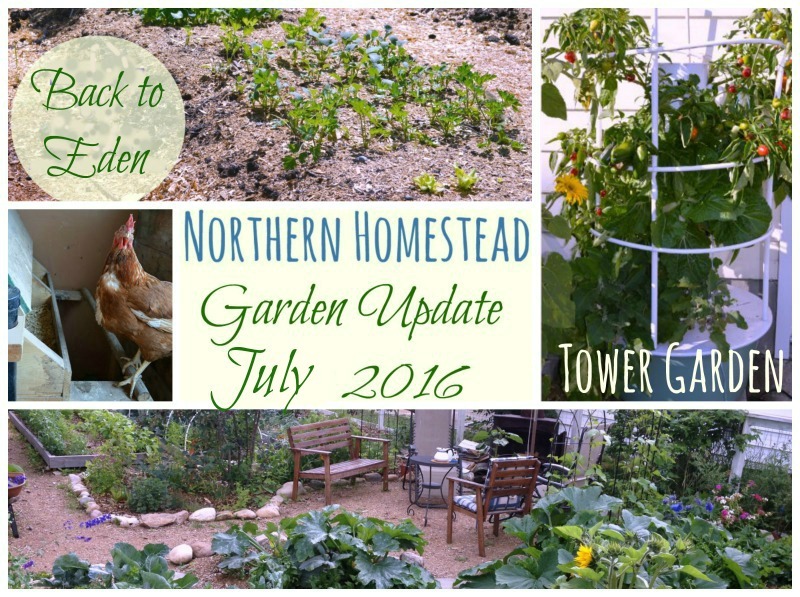 July was a good gardening moth – things are growing and ripening so nicely. In this garden update video we talk about tomato varieties in a greenhouse, Ruffles greenhouse, and the Tower Garden. We take a look at the ground cherries and some other highlights. Hope you enjoy the tour and please tell us what is growing in your garden. Oh… what a wonderful garden you have! I do enjoy the tour and I’m just amazed at how well everything grows. You really inspire me with gardening. Unfortunately I live in a apartment, so it has to be on a small scale. I hope I can start next season. (I wish I could find something like the Tower Gardens here in Sweden. I really love them). By the way, do you mind putting small texts with the names of the plants as you do the tour, please? I don’t get all the English names as they are unfamiliar to me. Thank you Dewi for your kind words. We too started gardening while still living in an apartment. Our balcony was over loaded with pots. You might wont to read Growing food without owning a speck of land to get even more inspired. For plants names and varieties it is more helpful to look locally. Find a seed company close to you or with a climate similar to your. Ask local gardeners what they grow. This way you will find plants adjusted to your climate. I also share in end of season posts what did do well here. You can find some names of what we grow there. Thank you, Anna. Your advice is really sensible. I have bought some seeds here and hoping to grow them in the next season. I can already imagine a balcony full of pots 🙂 By the way, did you try to grow zucchini while you still lived in an apartment? Did it go well? I get the impression that zucchini grows to be quite big. I wonder if it needs a big and deep pot to grow. By the way, to another completely different thing. I read in the recent news about the forest fire in Alberta. I hope it is not too close to your place. I send my thoughts to you and your family. You can grow almost anything in a pot. Just look for plant varieties that are smaller. Often a seed catalogue will say so or have a pot symbol, to let you know this plant is small. Bigger pots are not always needed, it more depends on your watering abilities. A small pot will need water more often. Thank you for your concern about the fire, we are far away from them.